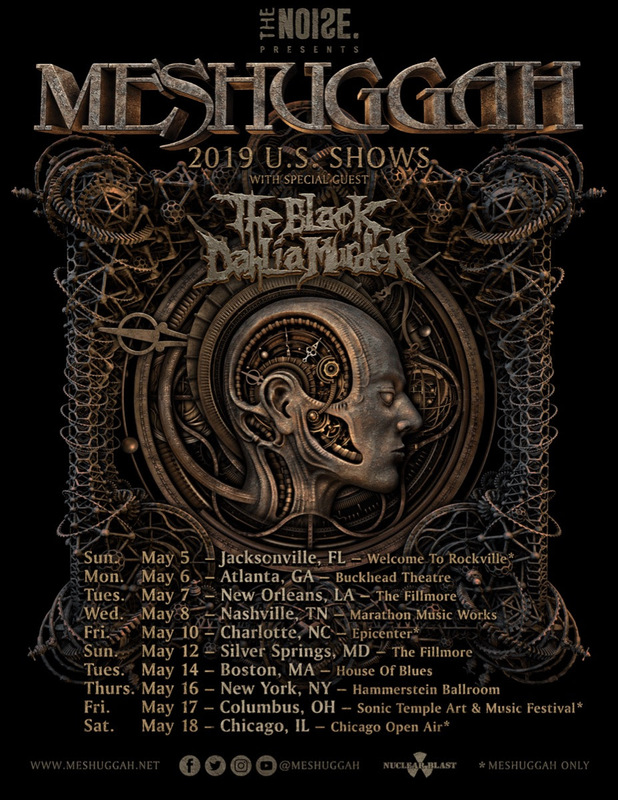 Swedish extreme tech-metal pioneers MESHUGGAH have announced they will perform a handful of special U.S. headlining dates this Spring to add to the four U.S. festivals previously announced. Leading up to the trek, the band will make appearances in South America & Mexico before kicking off their U.S. dates on May 5th in Jacksonville, Florida. The tour, presented by The Noise, will also bring THE BLACK DAHLIA MURDER as special guests for the headlining shows! MESHUGGAH will be touring in support of their highly acclaimed, eighth studio album, The Violent Sleep of Reason. The album debuted at #17 on the U.S. Billboard Top 200 chart as well as landed at #9 on the Canadian Top Current Albums chart. The Violent Sleep of Reason secured the band their first GRAMMY nomination for “Best Metal Performance”. Watch the music video for “Clockworks” on the Nuclear Blast YouTube Channel! Tickets for the headlining shows will be available for purchase on Friday, January 25th at 10am local time. MESHUGGAH is releasing an exclusive collection of vinyl reissues celebrating the bands legacy. The collection offers a limited, one-time only pressing that includes re-imagined cover artwork, redesigned gatefold jackets, and audio mastered for vinyl. The reissues for Nothing, I, Catch ThirtyThree, obZen, and Koloss are now available to pre-order at nuclearblast.com/meshuggah-reissues.